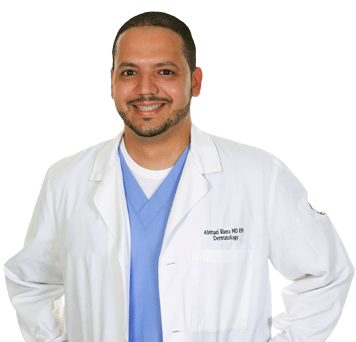 Board Certified Dermatologist, completed his medical education and residency training in Dermatology at the University of Puerto Rico, Medical Sciences Campus in San Juan, Puerto Rico, where he was born and raised. He earned bachelor degrees in both chemistry and pharmacy before attending medical school—and he continues to maintain a license to practice Pharmacy in Florida and Puerto Rico. He is frequently a presenter for continuing education courses, and has taught courses for medical and pharmacy students. Dr. Rivera-Cruz practices medical and surgical dermatology, treating skin cancer, psoriasis, rashes, hair and nail disorders, among others, in both adults and pediatric patients. He is currently a member of the American Society of Dermatological Surgery, American Academy of Dermatology and American Medical Association. He lives in Sebring, FL with his family. He enjoys biking, traveling, cooking, visiting relatives and friends and learning new languages. Currently, he speaks three languages: English, Spanish, and French (which he taught himself).